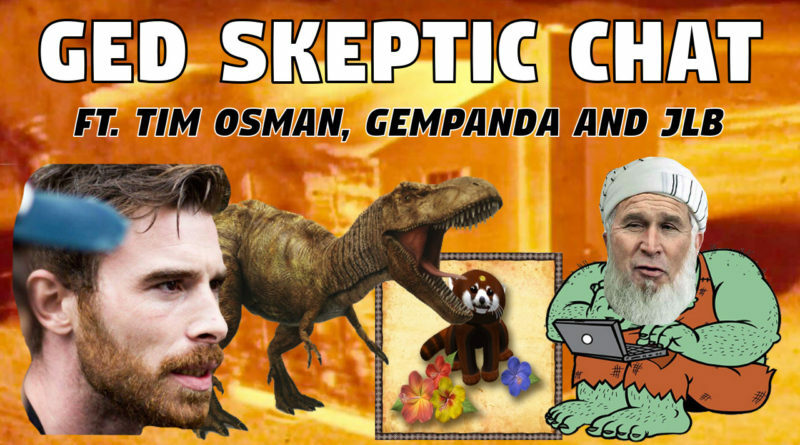 On Sunday, 12-Feb-2017, I took part in an unplanned, live google hangout hosted by Ged Skeptic, which also involved notorious YouTube ‘truther troll’ Tim Osman and British normie Gempanda. This mp3 file includes the section of the call involving myself as well as some thoughts recorded in post-production a few days later. The broadcast took place just hours after the leading Flat Earth spruikers had begun promoting an ‘international convention’ to take place later in 2017. Topics of conversation include the FE scene and its many charlatans and suckers, the existence (or otherwise) of dinosaurs and nuclear bombs, the ‘truth’ scene in general, and broader questions of epistemology and what can be known. Thanks, mate. I’m glad I decided not to edit this one (other than the audio I added at the start and end), not only because it saved me a lot of time, but because of those very silences. They were a good bunch to chat with, though. In a better world and with more time I would like to have those kinds of live conversations more often. Excellent discussion. I heard several pauses (as mas pointed out) where people seemed dumbfounded. But at least they were amicable to discussion. Now, did I understand you to say that we are on a ball type planet that doesn’t spin? I have been researching The Electric Universe for years. How would this fit in to your theory, if at all? Good question. I am currently in the process of writing an article to explain in detail my own ‘cosmological model’. I have explained it in brief a few times, but once it is written down for people to read at their leisure, I think it will make a lot more sense. Basically it boils down to this: the map is not the terrain. The best model for representing observable phenomena (both known and future) is not necessarily a representation of the earth as it would be seen by some hypothetical distant observer. That is, if I infer a model which accords with the earth and the heavens as they are known to operate, and that model is a ball, it does not mean that we live on an actual, physical ball. I have come to learn that many people cannot grasp this, which is why I am putting so much effort into explaining the epistemological underpinning of the theory before publishing the article. The Flat Earth spruikers (deceivers and deceived alike) have a picture to market. The establishment has countless hours of film and television footage burned into peoples brains. What does the stationary ball model have to offer in this regard? Any pretty pictures? No. Only reality as we actually experience it, which is no match for imagination in this day and age. That said, I am optimistic that there exists a sufficient audience to make my efforts worthwhile. Stay tuned! As for ‘electric universe’, I have not personally spent much time looking into it, but am more than willing to look at any articles you can recommend. Very enjoyable listen, thanks JLB. When I listen to you discuss these things, I find that my opinion tends to be right in line with yours. It was all fun and games when you’re making fun of the Flat Earth, but there were some definite triggerings later on. As you said, all those topics are interconnected, and if you pull on one thread (be it Apollo or Nukes or whatever) the whole things starts to fall apart, and very few people can fathom deception on that scale (even if you point out how bloody EASY it is to fool people). Their arguments against your arguments were rather weak I must say. Tim says that your position is a philosophical one, implying that you only don’t believe in the Apollo missions because you weren’t there, but as you said the footage is a complete joke, and then there’s the actual evidence. I think you are mischaracterized here as someone who just “believes nothing” just for the hell of it, or only believes things if you personally experienced it. I think that was the only real way they could come at your position, because they can’t argue about Apollo or Dinosaurs purely based on the evidence. Based on how Tim speaks I think he has taken the blue pills, and would never change his mind on something like Apollo no matter how much logic, reason and evidence you were to put to him. Who was the guy you were talking about at the start who was apparently worth listening to, Jay Somebody? Well put: ‘all fun and games’ when we are mocking other peoples silly and baseless beliefs, but not so fun when the blowtorch is turned around. This to me is human nature, and not a criticism of the three other members of the chat. In fact I think they handled the heat much better than most characters in this scene, which was one of the main reasons I wanted to upload and promote the podcast. Tim is correct that my position is a ‘philosophical’ one, insofar as I make a distinction between my beliefs and objective truth. That is, I happily admit that something may be ‘true’ even if I do not myself believe it; moreover, I am happy to not ‘believe’ something, even if it seems like the most plausible of options put before me, unless I feel sufficient evidence is available. This comes down to epistemology and what we believe knowledge is, and in a future article I will go into further detail about my views on this. You are quite right that Tim misrepresented my reasons for not believing in the Moon Landings. I don’t know if this was intentional, or if he simply misunderstood my position. Either way, anybody who believes in the Moon Landings must necessarily believe that the moon is a solid, physical object which could be walked upon. Ask a believer why they believe that. They will have no more ‘evidence’ than what they have to believe in the Moon Landings in the first place. Appeals to authority, appeals to majority opinion, appeals to TV footage… that is all. These are things that even ‘conspiracy theorists’ generally do not question, because nobody has told them to question them. If somebody doesn’t instinctively question their own premises, then they are only ever one ‘thought’ away from nonsense. Those who paint me as someone who ‘doesn’t believe anything’ are sophists at best and retards at worst. How could somebody possibly not believe anything? It is an obvious strawman right from the get go, and as soon as I hear somebody throw that ad hominem my way, I already know I am dealing with somebody incapable of the kind of conversation I am interested in. Sadly it happens time and again. The person we mentioned is Jay Dyer. 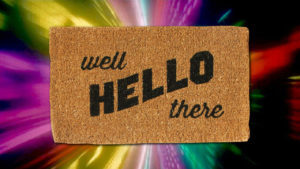 I give a brief overview of his work on the Membership FAQ page of this site. Basically a man in his mid-late thirties who focuses on philosophy, but uses Hollywood film as a vehicle to share his insights about topics like geopolitics and the ‘deep state’ with a wider audience. He has gained more prominence since releasing his book ‘Esoteric Hollywood’ and gone on something of an online book tour over the past few months. Jay seemed to align himself with ‘alt right’ personalities during the US election campaign, which I hope was merely a tactical ploy to help boost his profile and book sales. Also a regular participant at ‘Hoaxbusters Call’. I recommend you check him out (and, as is my own practice when listening to somebody new, I recommend you don’t just judge him off one or two of his shows, but try a bit of his back catalogue before making any judgements). It is amusing to think that one of the better conversations I have had on these topics was with a group which included a self-admitted troll and a proud normie. No doubt we were aided by the presence of Ged who seems genuinely skeptical of official stories and open-minded to new perspectives – without him there it might have gotten out of hand. Excellent convo John, Ged, Tim, and Gempanda. Uber entertaining and resourceful. I hope you continue these discussions as you mention, so much to take from these chats, same as the ball earth skeptic sessions. All the best on your trip John, wish you had someone to point the lens for you, but maybe going it solo is training for something bigger down the road. Not to minimize this pursuit, especially if a film festival could be realized. Imagine thousands, of normies, losing sleep over their childhood dino co-dependencies getting shattered, and afterwards searching/finding the culprit, ending up at this site, realizing they’d only glimpsed the tip of the iceberg. One can only dream. Again, all the best. Thanks, CB. I suppose one of the major drawcards of the BESR series was that open discussion and opposing opinions were central to the format; it was the whole reason for the show existing. The scene now seems dominated by echo-chamber go-along-to-get-along time-fillers, and random hangouts which allow disagreements but have no civility and usually devolve into juvenile shouting matches. I’m sure that many people would like another BESR-like show which keeps things civil and allows (and encourages) disagreement. Hopefully in time somebody (or some group) comes along to fill the void, but I’m not counting on it. As for the Dinotrip, thanks again for the support. After several postponements I am close to publishing an official webpage for the project and publicly announcing an official launch date. Stay tuned! I realize this isn’t the most timely place to comment, but I just recently started exploring your site, and I just listened to this particular podcast, earlier today. (I have also listened to the “ambush” podcast, with the four heliocentric scientists). Your manner of discussion about these topics strikes a chord with me. I’ve never really identified as a “skeptic,” per se, but after hearing your explanation of your skepticism, I realize I tend to naturally view things in that manner. I certainly makes people uncomfortable, and they are desperate to pin you down to your belief system. In just the two podcast I’ve listened to, there were multiple attempts to get you to “explain your beliefs”. I laughed out loud, multiple times, as I could sense the exasperation at the lack of ability to corner you into their mode of thinking. Anyway, I’m looking forward to checking out more of your work. Sometimes I think of real skeptics as a dying breed, because there are so few of us traversing the earth and the internet at this time. But then I wonder if perhaps this website will be looked back upon in years to come as a key plank is the dawn of a new era of real skepticism! You are quite right that it makes people uncomfortable, which is one of the reasons I partake in far fewer live shows these days than I did back in my heyday. It is not in my interests to upset people, and people tend to get very upset when you point out that so many of their beliefs are based on nothing more than stories from the telescreen. You might be surprised how much time goes into editing these chats to bring them up to releasable quality (even just recording the intro, inserting it at the beginning of the show and rendering a new file takes time). Therefore it is particularly pleasing to know that the fruits of that labour are still being enjoyed by others all these months later.